Though I no longer have live rabbits, I have quite a huge collection of rabbit figurines, collectibles, and decorations. And they are stinking cute! Death is inevitable and unavoidable. I have written before that in keeping animals as pets, we are given the opportunity to see our pets go through their entire life cycle – from birth to death. Throughout the years, I have known many wonderful people who have adopted my rabbits and I still receive updates from most of them. Today, I received devastating news that Dovehill’s Faith has since passed on. She came to us in May 2011 as a rock solid doe. She has stumpy front legs and a body that every Holland Lop breeder strive to produce. Faith has produced some of the best offspring and have definitely improved the quality of my herd since her arrival here at Tru-Luv Rabbitry. One particular litter she produced two bucks and one of them was Tru-Luv’s Murdoch. I must thank Cheri for her generosity in sharing Faith with us. Thank you Tracey and family for giving Faith an amazing home. Binky free dearest Faith and may we meet again in that wonderful place you are at. This was her at the show and us cheering her on! My first rabbit convention was back in 2011 at the 88th ARBA Convention (Indiana) and it was an experience of a lifetime. Like many firsts in life, I do not think I will ever forget the experience. And it has not been the same since. The friendships and relationships that I had prior, during, and after 2011 grew over the years and it makes me really happy to know that I now have a bunny family across the globe. One that loves me unconditionally – with or without rabbits. And it is because of this wonderful bunny family that I decided to embark on this “full circle” trip to Indiana once again for the 94th ARBA Convention at Indiana. At the beginning of my journey, I told myself that this could be my last opportunity and I will cherish every moment – come what may. After more than 30 hours, I finally arrived at my destination. It felt like coming home after a very long time. After a well rested night, we headed out to the fairgrounds and it felt so good to be back here again. Approximately 21,000 rabbits from 49 breeds under one roof this time around with the Lionhead and Argente Brun added to the list of recognized breeds since my first convention here. As usual, there were many amazing animals and the finest representations of each breed. Besides from seeing my bunny friends from all over the USA, I made new friends and added new members to my bunny family. The highlight for me personally was meeting the lagendary Kay Miller for the first time. If you have been following my blog, Kay was the generous soul who had been monumental in getting my herd started. Without knowing who I was, she had sent me a top lop in Carmel and my all time favorite herd buck, Clark. To finally meet Kay was truly a dream come true for me. I finally had the opportunity to thank her in person. I truly enjoyed myself throughout the convention which was held from 1st until 5th October 2017. It was nothing short of Friendship, Fellowship, Fun, and Food. I realized that because I was a new visitor back in 2011, my focus was on rabbits alone. But this time around, it was a lot of fun hanging out with the bunny family. I felt so blessed knowing that not many will have the same opportunities and the experiences that I had. The feeling ia truly priceless and indescribable. Just a few months shy of raising Holland Lops for a decade, we lost our last rabbit today. Reflecting and reminiscing the past 9 years, I cannot help but to realized how much these rabbits has helped me grew as a person. Many Holland Lop breeders came and gone but ultimately, not everyone will have the same experiences. I can only say that my experiences were very fulfilling and to a certain extent soulful. 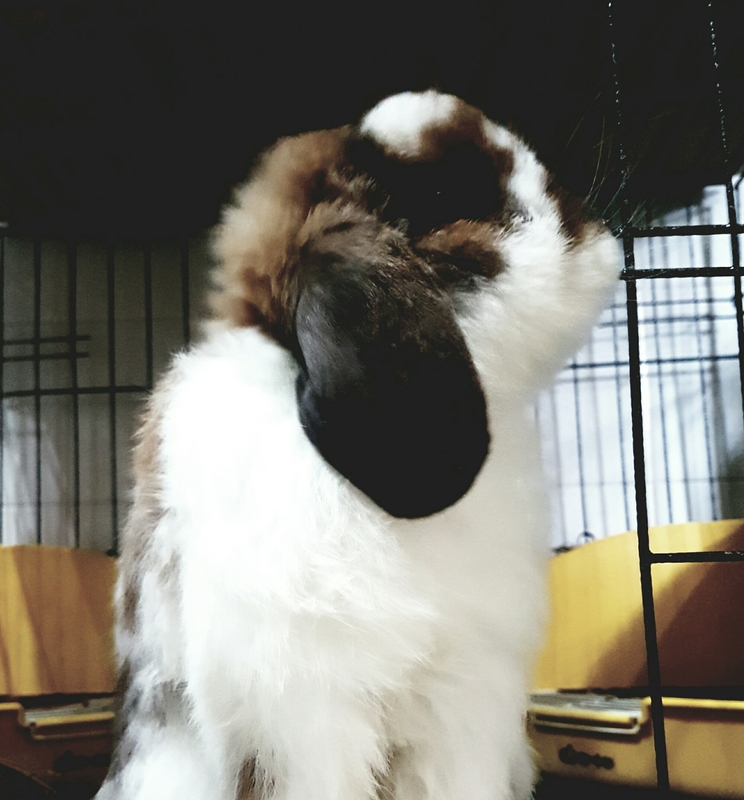 If you are aspired to be a Holland Lop breeder, you should always be yourself and enjoy the journey by defining it your way. All the past rabbits that graced Tru-Luv Rabbitry make up a bridge that paved the way to many amazing and wonderful friendships. They are the reason why I have an awesome bunny family consisting the many greats and champs of the hobby. Though a rabbit passes on, a family stays together forever. It is almost a 10 years journey and through all the ups and downs, they were right there with and for me. They have given me so much joy and at the same time heartbreaks. How can you ever let go of such a strong bond? Life isn’t perfect but these rabbits have been my pillars of strength and focal point in life throughout the “turbulence”. As each one of them left and passed on, it is as though life is telling me that I am leveling up in this game of life and moving up in the ladder of life. The last one seemed to mark my “graduation” in this life’s course and closes the chapter of this thick book 10 years in the making. Truth be told, no one will ever know what these rabbits and people have done that changed my life for the better. 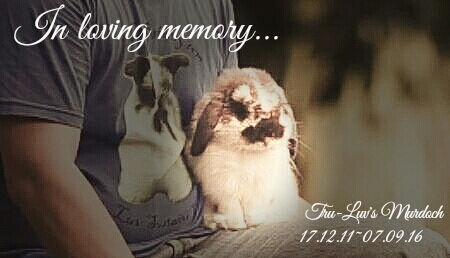 As such, I just want to take a moment to remember Tru-Luv’s Murdoch – the true symbol and legacy of Tru-Luv Rabbitry. He was born together with Clarkie on the early morning of 17th December 2011. He was initially named Luv and since they were born during the Christmas season, they became the poster kits for the 2011 holiday season. Hope & Luv the theme for the season! As Murdoch grew, there was something very special about him and he reminded me of Miller’s Clark. How can you not want to HOARD over such cute faces? The older he grew, the more handsome he became…. Murdoch is another special one. He won 1st BJB in one of the recent shows and I hope he continues to produce beautiful babies for me. Third generation produced here. Celebrating his 1st birthday and 2nd Christmas with us. A recent photo of Murdoch enjoying his salad. I try not to think too much about his passing but the thoughts of him waiting for me to get home before breathing his last is heart breaking. The fondest and most endearing moment with Murdoch was during the Natural Pet Success Story video shoot (Thank you Stanley Saw for this wonderful experience). Murdoch is seen on camera in his best behavior and sitting very still on my lap. In fact, that is Murdoch and he behaves very well all the time. 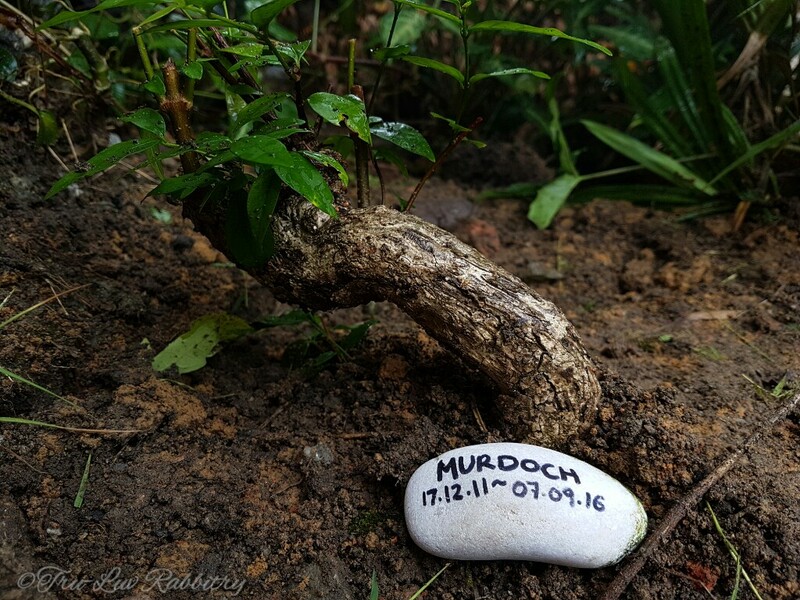 Like the many great Tru-Luv bunnies of the past, we laid Murdoch to rest on a rainy Tuesday morning. I believe that death is not the end but it paves the way to a new beginning. We planted a little tree above where he was laid to rest as a symbol that he will continue to nourish this plant. His death is not in vain but will sustain this plant. And in turn, the plant will sustain other life forms through its purpose in the ecosystem at large. I LOVE YOU BUDDY, SEE YOU ON THE FLIP SIDE! I am not sure about you but some of us grew up with stories like “the tortoise and the hare” and know very well the moral values that it instills in us. A story that teaches us to be humble and never underestimate others we perceive as weaker than ourselves. “Slow and steady wins the race” is in fact the essence of this famous story. Back then we can imagine a huge green tortoise and a hare with very long pointy ears. After so many years of selective breeding, who would have thought how different that image will be today. If the story of the tortoise and the hare is rewritten today, how will the two animals look like? So which have outrun the other, the tortoise or the hare? It sure has been a long while since we last greeted each other. How is every bun and everyone doing out there in the great big world? Hope all of you are having a jolly good time! First of all, please do not feed me chocolates. It will cause me to have stomach upset! Howdy! How are ya’ll doing? It really has been a long long time since I last posted something worth reading on here. I guess life’s been quite hectic for the past couple of years and it still is. But today, something made me think about what I used to enjoy doing over the weekends. Taking photos of my bunnies, of course! And that’s exactly what I did for the past couple of hours. 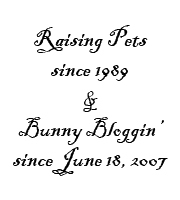 I kind of miss bunny blogging as it turned out. While taking photos of my bunnies, I thought about what caused most of the problems I had in the rabbitry. 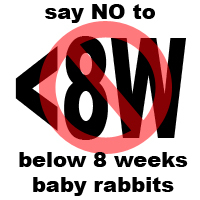 One of the reasons we pet owners and breeders tend to overlook is fussing over the rabbits. I must admit, through the years fussing over the rabbits have caused more harm than good. I am not sure why but perhaps for two reasons. One, when we fuss over a certain rabbit too much, we tend to take notice of the tiniest of details. So much so, we become paranoid and in turn, causes stress on us as well as the poor rabbit. Two, I have reasons to believe that some bunnies are attention whores and tend to get way too manipulative. In fact, we trained them that way – fussing over them and each time they act up, we give them all the attention just like a wailing baby. Doing that often sort of makes it habitual and the bad cycle repeats itself. In all honesty, my longest living rabbit is one I fuss over the least. Hope ya’ll having a good weekend!